Rebekah Parton reads to the 5th grade. March 2 was a busy day for the students and faculty of East Side School. 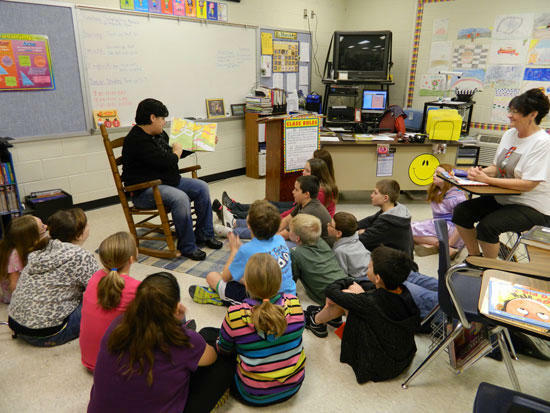 Read Across America day was celebrated with several activities. The Cat in The Hat, along with Thing 1 and Thing 2 spent the day at the school, and students were asked to dress as their favorite book character or to bring their favorite book to school. Readers from across the county read stories aloud to the students, and kindergarten students were even able to eat green eggs and ham. Read Across America is celebrated annually in celebration of Dr. Seuss' Birthday. Thanks to those community members who helped East Side celebrate the day.